Just a little way to say thank you to my followers for indulging me with their kind comments during my first year of blogging! I am very lucky to have made so many good friends, and I'm continually inspired by the work that I see in blogland. As a small gesture of my gratitude, I am giving away $25 of merchandise plus free shipping in my Etsy shop to the winner of the giveaway. Please leave a comment below and tell me what you would like from my shop. I will draw one name on Monday, May 16. You must be a follower to participate. I love all of your work, and your tutorials! Within your Etsy shop, your little glitter house kits are my favorite and just darling. Thank you for hosting such a fun giveaway! Very tempting, mouthwatering giveaway. Please count me in. Hugs! Hi Carol,congrats on your first blog anniversary!!!!! !It is a pleasure visit your blog.In your etsy shop I love your mini glitter houses and the cake stands of course. I would love to participate in your anniversary giveaway,sweet regards,Sonia. Hi Carol! I love just about anything you make. :) I wish your blog to be of much success and have more followers to come! Hola Carol. Felicidades por el aniversario de tu blog. Me gustaría participar en el sorteo, me gustan tus casitas. Congratulations to your first year of blogging! Your posts were and will be such an inspiration for my works! I love your dessert towers, please count me in. Hi Carol,congrats for your blog anniversary! Please count me in your Give away!I love your mini houses,so I have already halloween and spring so I would like xstmas one! I put the banner in my blog! Gosh doesn't time fly. Well I would love to add to my collection of your delightful mini houses. The tulip ones look perfect for my Harry Potter plant shop. Congrats on your first year of blogging! I've only been blogging since September, it's so much fun! I'm so glad I stumbled across your blog and etsy shop! Everything you have is so incredible! Oh my how adorable please coint me in I would love thedessert towers green stripe, pink stripe and the flutterby tower!! Congrats!! Carol, Congratulations on your one year Anniversary blogging! Hasn't it been one glorious year?!!!! I have loved it and share your sentiments! I would love to participate in your giveaway for a chance to have one of your cake stands(white). dear Carol, you know what I'm grateful to you for your intelligent tutorial, for printing and for your friendship! your blog is always so interesting, so I make you my best wishes for the first year of blogging, and wish you many happy years yet! I put the link in my blog, and cross my fingers! thanks very much, for this opportunity! Best wishes! I would have to leave it to you if I won, everything is AMAZING! Felicidades por este año pudiendo disfrutar de tus geniales trabajos! estoy enamorada de tu Mini Dessert Tower Kit: Pink Stripe. Un beso. Thanks for the chance to win one of your items! I love them!. Congrats on your first blog anniversary!It is a pleasure visit your blog.I love your mini glitter houses and the cake stands, of course!. What beautiful colours! A generous giveaway, please count me in. Feliz aniversario de Blog Carol! de tu tienda me gusta TODO!!! las casitas glitter son mis favoritas, anótame en tu sorteo, pongo un enlace en mi blog! Your sweets are very tasty!!! and the cake stand is very pretty! What a great giveaway. I thank you for the chance to win. So please count me in. I love the glitter church kit and your cake stands. me gustaría participar en tu sorteo, ahora mismo tellevo a mi blog.Besos. Anche io voglio partecipare.......è bellissimo e sei bravissima!!!! Spero di vincere!!! Congrats Carol on your blog anniversary...your work is beautiful... I have to say the pink cupcake stand is my favorite! 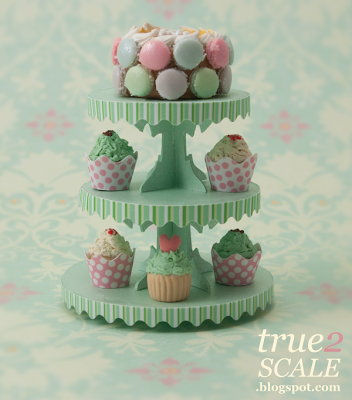 I'm delighted to follow your blog; your mini tower of cupcakes are charming and delicious. Thank you for doing this giveaway! I'll link you in my blog. Happy anniversary!! Your work is amazing and I love you blog! This is a chance I don´t want to miss, please count me in! I love the pink cake-stand and the white cake-stand kits and the cake boxes, they are so elegant! All your works are so beautiful! !Please count me in your giveaway!! Please count me in in your wonderful give away draw?